Those three words affect everyone in your house. When those words appear in stores and on screens some parents and kids jump up and down in celebration. And other parents and kids run and hide and pretend it’s not happening. It’s happening. It is time for your kid to go back to school. I’ll give you a moment to jump up and down or run and hide. During transitions like this, dads offer a different kind of perspective. We see things differently. Our family hears us differently. A dad’s voice is important and needs to be heard during the back-to-school season. Your child and spouse will play off of you. They will see going back to school, their teacher, their classmates, the school, etc. better if they sense you being positive about these things. 1. “You are a good learner and a good friend.” Over-communicate how much you believe in your child’s ability to learn and be a great friend to their classmates. 2. “I love you and am cheering for you no matter what.” Make sure your child knows you love them and are cheering for them this school year…no matter how this school year goes. Your love does not depend on their performance at school. 3. “What was your favorite / least favorite thing about today?” Ask specific questions about how their day went. Avoid “yes” and “no” questions. 4. “Heavenly Father, I pray for…” If you pray, pray out loud with your child about their friends, teachers, schoolwork, recess, bus ride, homework, locker, _____ (whatever they’re anxious about). Don’t worry about praying out loud…you can’t mess it up. 1. Celebrate! Get some ice cream, go to dinner, buy a cake, throw some confetti…do something fun to celebrate your kid going back to school. 2. Drive. When possible, drive your kid to school and/or pick them up from school. The conversations that happen in the car are priceless. 3. Rest. Give your kid some down time after school. Remember, school is their version of work. 4. Help. Help your kid with homework. Yes, there will come a point when you don’t understand what they’re doing, but help until then. 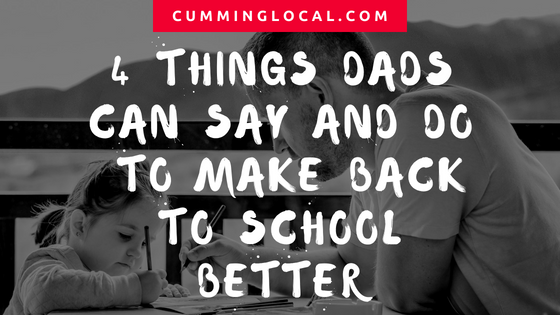 Dads, a combination of your words and actions can make back to school better this year. And if you need a little extra motivation, back to school means the start of football season! Casey Ross has been married to Julie for over 20 years and is the dad to one daughter and two sons. 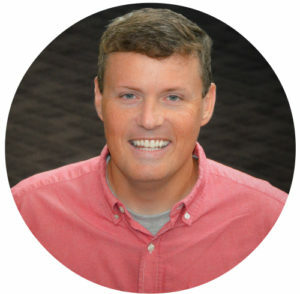 Casey and his family share some common loves: the Atlanta Falcons / United / Hawks, Mexican food, Hilton Head Island, and just about any kind of competition. Julie and Casey mentor engaged couples, lead married small groups, and lead small groups called Starting Point at their church. If Casey is not at home or work, you can probably find him at Chick-fil-A enjoying a Frosted Coffee and a Diet Dr. Pepper or working out. To read more about Casey and our other contributing writers, click here.